Cottonwood Farm. 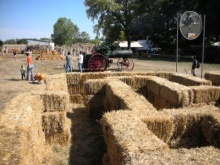 Pumpkin patch, hay maze, animals, antique farm equipment. Plenty of fall produce, including decorative gourds and corn bundles. Free admission. (Wagon rides cost extra). Open daily 10:00 to 6:00pm cottonwoodfarms.com. Munson Farm. Pumpkins, fall fruits, vegetable. Hayrides, corn maze, pumpkins. Free kids pumpkin with purchase if you print out the first page of their website. Free admission. Open daily 9:00 to 6:30pm. Valmont Road and 75th Street, Boulder, CO. munsonfarms.com. Red Wagon Farm. Pumpkins, winter squash, apples, and more produce! See farm animals (alpacas, llamas, goats, chickens, geese!) and enjoy the Straw Bale Maze! Free admission. Open 10:00 to 6:00 daily through Halloween. Red Wagon Farm Website. South Boulder Pumpkin Patch. Grand Opening October 11 & 12 noon with food trucks and lots of fun for all. Saturdays & Sundays noon to 6 and weekdays 10/20 through 10/31 from 4 to 7pm. 3485 Stanford Court, Boulder, CO 80305. SoBo Pumpkin Patch Facebook Page. 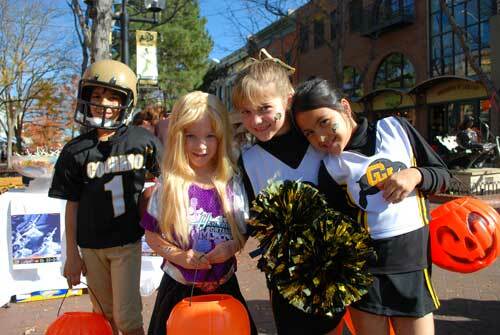 Munchkin Masquerade – October 31, 2014 Bring your younger kids down to trick or treat amongst their peers along the shops on Pearl Street Mall. Always a family favorite! The kids are adorable in their costumes. The treats are everywhere. It could not be more fun. October 31, 2012 from 3:00 to 6:00pm rain or shine. For more information visit DBI Website. Family-friendly Halloween event features rides in the vintage passenger cars with conductors and engineers in full costume; a “silly” graveyard; and a pumpkin patch. 10am-4pm at the Colorado Railroad Museum, 17155 W. 44th Ave., Golden. October 25 & 26. Colorado Railroad Museum Website. Purchase a pumpkin and watch it race down the lazy river with the rest. Winners receive prizes like free rec-center passes. Carnival games begin at 4 to 5:30pm; pumpkins launch at 5pm sharp; the pumpkin-carving contest is at 1:30pm. Bob L. Burger Recreation Center, 111 W. Baseline Road in Lafayette. 303-665-0469 City of Lafayette Website. This entry was posted in Uncategorized and tagged Anderson Farm, Boulder, Colorado, Cottonwood Farm, Downtown Boulder, events, Halloween, Kids, Munchkin Masquerade, Munson Farm, Olin Farm, Osborn Farm, pearl street mall, Pumpkin Patches, Rocky Mountain Pumpkin Ranch, South Boulder Pumpkin Patch by Boulder Families. Bookmark the permalink.